Warner Bros. is at it again with another collector’s edition box set, this time celebrating one of the most recognizable young faces in Hollywood history, James Dean. The “James Dean Ultimate Collector’s Edition” is more or less exactly what you’d expect: Dean’s iconic three best known acting performances and a whole slew of intriguing extras in a large, heavy sided case which will take up some impressive real estate on your DVD shelf. Some casual internet research has revealed that Dean’s estate still brings in roughly $5 million annually. Considering he died in September 1955 at only 24 years of age, you can imagine what he’d be making today if he’d lived and performed event a few years longer. Even in this age of modern technology everywhere we look, you’ll still see his image plastered in a mall or a teenager’s wall every now and again. Not knowing who he is might as well be a crime in the serious film buff’s mind. There have been college classes taught specifically about “East of Eden,” “Rebel Without a Cause” and “Giant.” Critics and fans have been brainstorming for decades, trying to pinpoint just what exactly made this good looking actor as big a deal as he was in the past and remains in the present. It could be as simple as him being the right actor for the right generation, or as complicated as his willingness to learn by experiment in virtually everything he did, from racing to acting to personal relationships. Slice it anyway you like, you can’t deny that James Dean holds popularity many would have killed for and prestige even more could never even come close to attaining. Dean was the first actor to receive a posthumous Academy Award nomination for Best Actor, and apparently remains the only actor to ever have had two posthumous nominations. 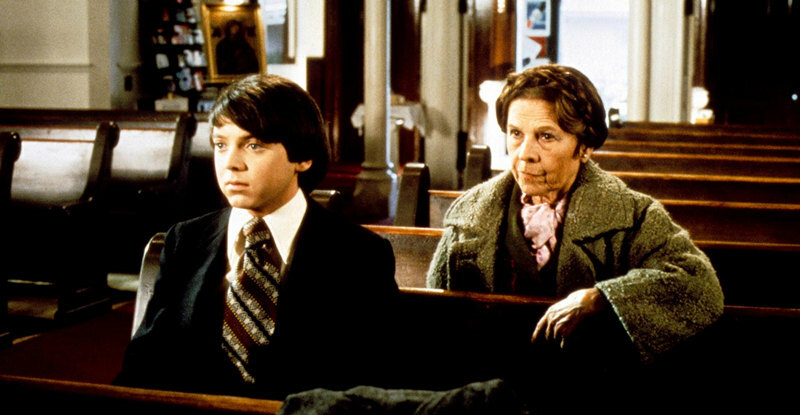 His life prior to film was rocky at best, with his mother’s death from uterine cancer happening when he was nine years old and his father sending him to live with family in Indiana to be raised. Education was never his forte, but it did catapult him into theater and film, both areas where he unearthed skills that undoubtedly influenced the rest of his life. Apparently he spent a semester at UCLA before dropping out to pursue his full-time acting career. In “East of Eden,” (1955) Dean plays Cal Trask, son of a farmer whom he believes prefers his brother Aron (Richard Davalos) over him. The father, Adam (Raymond Massey), has told his sons for many years that their mother is dead, but Cal thinks otherwise. He tracks her down and borrows money to enter the vegetable business, while simultaneously, Aron’s girlfriend Abra (Julie Harris) finds herself interested in Cal. A romantic triangle emerges as the two brothers grapple with one another and their family dynamics in this loose adaptation of John Steinbeck’s 1952 novel with the same name. Of the films starring Dean in the lead role, this is the only one he personally watched from start to finish. Dean’s most famous film, “Rebel Without a Cause,” (1955) has more or less become a cultural icon for youth rebellion. Released a month after Dean’s fatal car crash, the film chronicles a young, defiant and troublesome Jim Stark (Dean) as he enrolls at a new southern California high school. His parents Frank (Jim Backus) and Carol (Ann Doran) have tried do change their lives to better improve their son’s, but things go south very quickly when he brushes a bully, Buzz (Corey Allen), the wrong way. Despite befriending another troubled young student named Plato (Sal Mineo) and a beautiful but misguided girl named Judy (Natalie Wood), Jim gets roped into a game of ‘chicken run’ that pits him and Buzz in two separate cars racing toward an ocean side cliff. Things spiral into a cat and mouse running game from here, leading to a tense climax were youth and old age clash against a backdrop of mistrust and anxiety. “Rebel Without a Cause” is often cited as the first teen push back film to encapsulate the loss of innocence a generation was experiencing without really realizing it. It was added to the National Film Registry in 1990. The final film in the “James Dean Ultimate Collector’s Edition” is “Giant,” (1956) where big names like Rock Hudson, Elizabeth Taylor and Rod Taylor star alongside Dean in a story that surrounds love, horses and wealth. A mistaken stumble on an oil well and a long reaching family feud drive some of Hollywood’s bigger names to push one another into various struggles for superiority and power. “Giant” runs three hours and seventeen minutes, was added to the National Film Registry in 2005 and took home the Academy Award for Best Director (George Stevens). It was nominated twice for Best Actor (Dean and Hudson), as well as for Best Picture, Best Film Editing, Best Adapted Screenplay and several others. A holistic review of Dean’s films reveals several prominent themes and messages that often overlap and connote commentary on the world he lived in. I often ask myself if people like Dean were aware of the impact and influence their work was having in the present, and I have to think that he knew he was, at least in some small manner, kind of a big deal. But was he valued for his work on the screen, his daring ways outside his professional setting or purely his charm and good looks? It’s probably a mixture of the three, but wherever you stand with his body of work, you can’t deny the themes and messages surrounding youth, innocence, curiosity and sexuality. My first interaction with James Dean actually had nothing to do with him. I heard his name in the Don McLean song “American Pie,” and got to explain to my fiancée when we watched “Rebel Without a Cause” where the reference in the song came from. It is one of many places in pop culture’s past and present where his name and influence still hold court. Given the amount of extra materials and perspectives included in the “James Dean Ultimate Collector’s Edition,” it’s pretty hard to argue with the balance provided in this impressive boxed set. More than anything else, this collection successfully celebrates the work Dean did on screen. His larger than life personality doesn’t take up too much space in the set, which helps to keep the emphasis where it should be: on the man, the myth and the legend that still captivates millions across the world in a totally different time and place. “East of Eden” and “Rebel Without a Cause” are both presented in 1080p High Definition 2.55:1 video transfers. “Giant” is offered with the same 1080p resolution, but the screen ratio is 1.66:1. The films were of course made quite some time ago, so there is some very visible grain and wear despite the HD presentation. Overall, bright colors are extremely vivid, while darks don’t take center stage but do have a secondary role. The clarity is pretty decent for films as old as these, but it’s evident they weren’t made yesterday. “East of Eden” – DTS-HD Master Audio English 5.1, Dolby Digital French 3.0 and Spanish 1.0. “Rebel Without a Cause” – DTS-HD Master Audio English 5.1, Dolby Digital French 1.0 and Spanish 1.0. “Giant” – DTS-HD Master Audio English 2.0, Dolby Digital French 1.0 and Spanish 1.0. All films are subtitled with English, French and Spanish. For the most part, the bulk of the audio is spoken words, which more or less come through without issue. Even though the emotion each film’s dialogue generates feels slightly forced every so often, it’s easily communicated to one’s ears thanks to above average audio soundtracks. I hope you’re sitting down, especially if you’re a big time James Dean fan. The “James Dean Ultimate Collector’s Edition” includes authentic production memos from “East of Eden” and “Rebel Without a Cause,” a 40-page commemorative book, behind-the-scenes photos, three mini reproductions of the original theatrical movie posters, plus three DVD documentaries: “James Dean: Sense Memories,” “James Dean: Forever Young” and “George Stevens: A Filmmaker’s Journey.” Additional featurettes abound on each disc, of course, as well as expert commentaries on all three films, premiere footage for “East of Eden” and “Giant,” wardrobe tests, screen tests and deleted scenes for “East of Eden” and “Rebel Without a Cause.” Oh, and behind the camera episodes, trailers and probably another half dozen things I’ve forgotten or simply not accounted for. There is a TON of stuff here! Make some room on your DVD shelf if you’re a James Dean lover. In high definition, the “James Dean Ultimate Collector’s Edition” is a set worth having many times over.